One of the most common questions students have is “How many times should I take the SAT/ACT?” This question is essential and the answer to it greatly impacts students’ testing schedule and their overall approach to the process. Taking the tests more than once is advantageous and is often a great way to work towards optimal scores. Jane Darveau from Jandl Associates explains, “Taking the SAT [or ACT] more than once can be beneficial because the additional exposure allows students to gain insights about the content and process of such testing. Extra testing experience can also lead to knowledge about personal content area weaknesses, which then can be addressed before the next test date. Testing exposure can also lead to strategies for calming nerves, managing time well, and working efficiently in a high-pressure environment.” The first attempt often serves as a good benchmark and highlights the areas students should focus on before the next test attempt. Multiple attempts are also beneficial because if a student is particularly tired or distracted during the test, he or she is able to try it again on another day when (s)he is more focused. 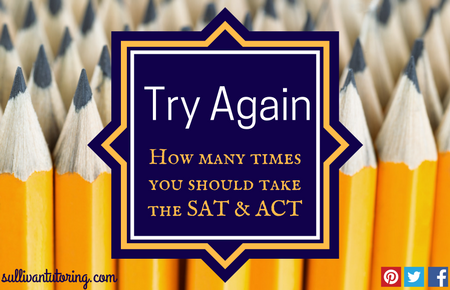 Though multiple attempts are advantageous and, technically, students are allowed to take the tests as many times as they want, it is important not to overdo it; while it is a good idea to take the SAT/ACT more than once, it is also a good idea to refrain from taking the test too many times. Three attempts may not seem like a lot, but this is more than enough if you use the time between each attempt to prepare and improve. Jane Darveau suggests, “enrolling in a formal SAT prep program, such as those offered by Sullivan Tutoring, can enhance a student’s familiarity with SAT/ACT testing without incurring the potential penalties associated with having too many test scores.” Tutors are able to look at a student’s preliminary test scores and determine an effective plan-of-action in terms of preparing for the next test attempt. Specific weaknesses can be addressed and strategies can be better implemented in time for the subsequent test dates. So as you plan out your Junior and Senior year SAT/ACT schedule, keep in mind the magic number—three—and remember to make wise use of the time in-between tests.